Former WCW and WWE superstar Bill Goldberg throws out the first pitch to jump start the Legends of Wrestling Night at Marlins Park. The promotion was in conjunction with the Marlins home game against the Colorado Rockies. After he threw a pretty good pitch to Marlins pitcher and wrestling fan Tom Koehler, a fan (planted) heckled Goldberg about the throw. So Goldberg speared him. 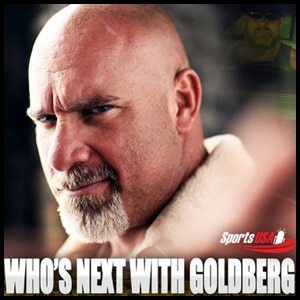 Unfortunately, for the large mouthy man, Goldberg still got it. Goldberg theme song Who's Next + Goldberg chant GOLDBERG! GOLDBERG! GOLDBERG!